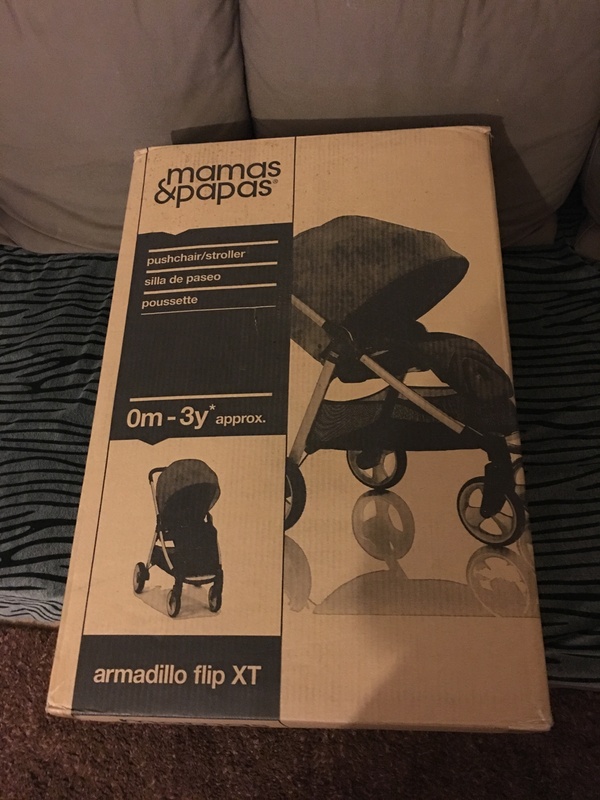 As a self admitted addict to all things Prams and Pushchairs it was without question that somehow the new mamas and papas armadillo flip xt would arrive at my door. 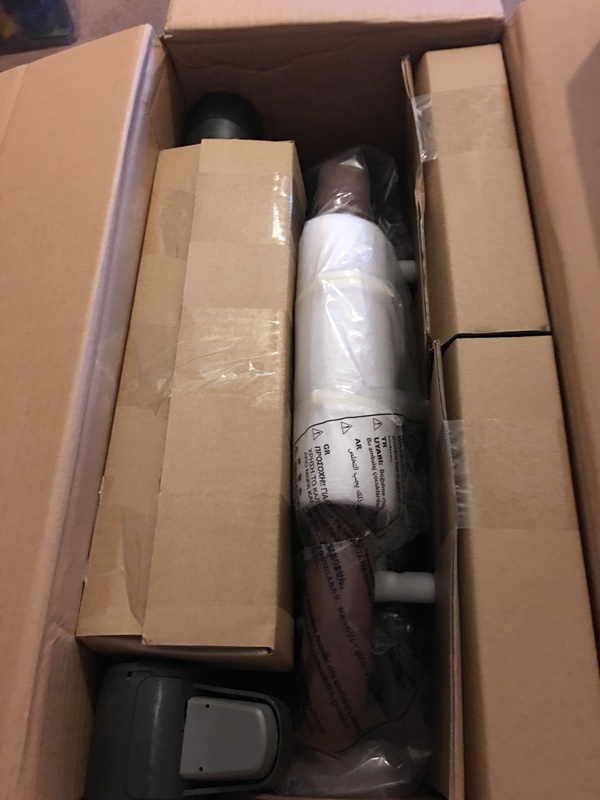 The Armadillo Flip XT arrived this morning as i sat eagerly awaiting its arrival, i almost hugged the delivery guy when he turned up at 10am ( hurrah to early morning deliveries! ;) Thankfully Jacob was playing happily in his Jumperoo and Frankie loves helping so i do admit i opened it as soon as i got it through the door..
Here’s how it all arrived boxed nicely, now to find a way of getting everything out without the help of some else was a bit tricky thankfully with a little help from a weirdly angled leg we managed to get everything out. Included here – main frame seat, two big wheels, the small front wheels ( tucked into the seat) the brake and the rain cover. First impressions of the Armadillo Flip XT is that is very luxurious, i love the foam quilted seat and i do have to admit I’m also an admirer of the leatherette handle. 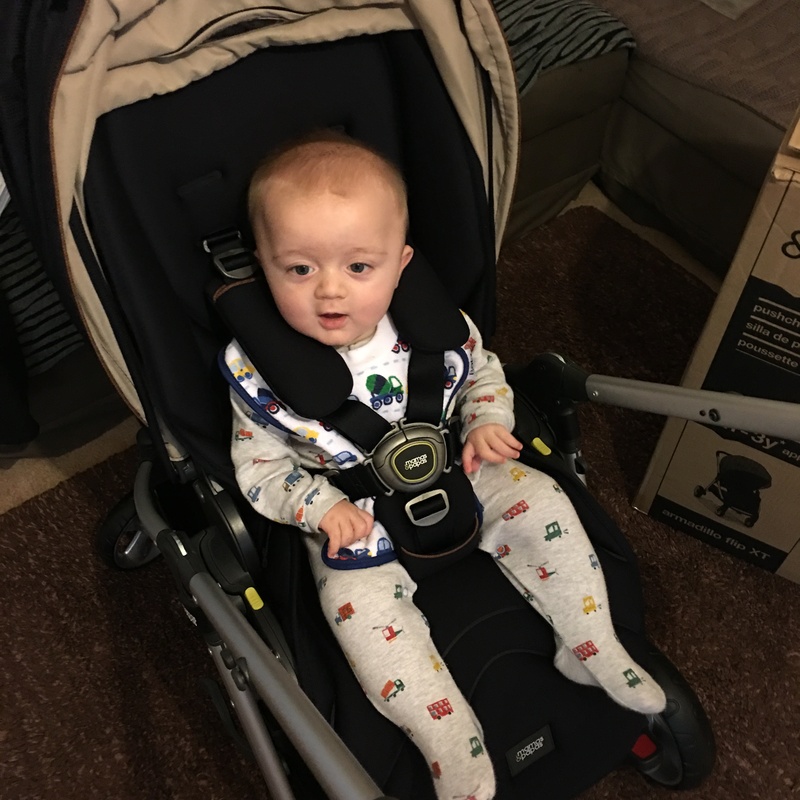 Here is Little Jacob sat in it ( 7 months) and i can also add his older brother ( 2 and a half) sat in it also and had plenty of ‘Wiggle Room’. I have added a link here if you are interested in purchasing the armadillo flip xt they currently retail for around £475 but keep your eyes out for deals over the christmas period, it is available in several large stockists so have a shop around. if you have any questions you would like covered in the main review please send me a message or comment below and il be sure to answer them. Nice to read an I boxing post as this is the pram we have gone for. 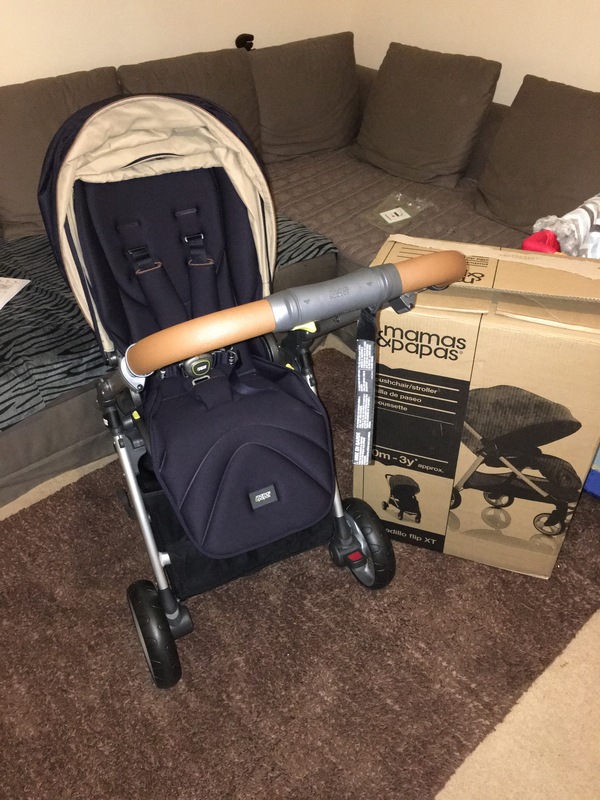 I love it and how easily and small it folds – I also have a fiesta so size was a priority when choosing! How have you found using it so far? Is it as easy, comfortable and as easy to move around as they make out? Thankyou for the feedback Becky. Yes I love how compact the fold is on this pushchair, it’s an easy fit in my fiesta boot and takes less than 30 seconds to get up and running. The basket is very generous also and easily accessible. My main niggles are that the 4 point saftey hardness comes apart 9/10 when I’m getting my son in and then it’s really fiddly and a bit stiff to get it all clunked back in. 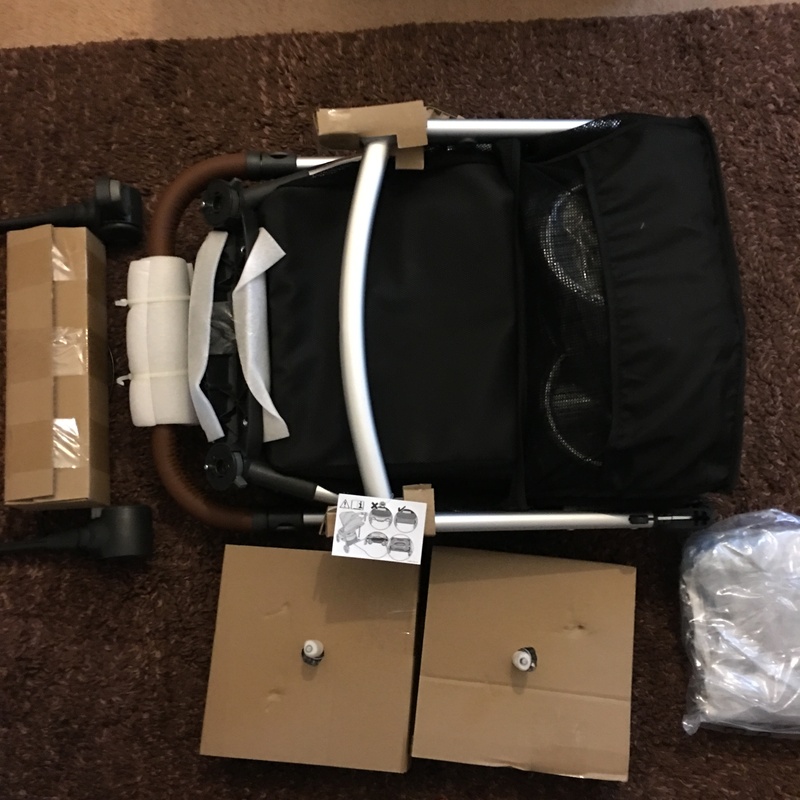 I do use this pram with a buggy board and do find it to get a bit front wheel heavy when that’s attached but that’s to be expected from such a lightweight pushchair. I want to apologise for such a slow reply, didn’t seem to get any notification of your message!